This is my favorite martini of all time. Ever since I went out for drinks with Nick before seeing Dolly Parton's Hello Dolly concert, I've loved appletinis. It was the first time I had ever been to Bump, and honestly, I had maybe a little too much, but BOY! was that a fun concert!!! Nick, you're such a bad influence! 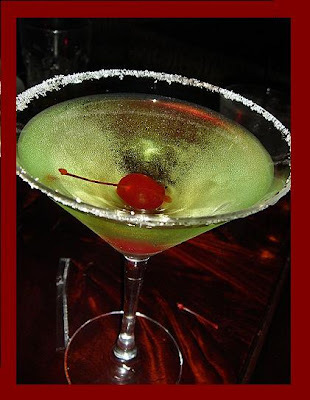 Since then, I've found that there are a million different recipes for apple martinis, and the variations range from green apple to sour apple to caramel apple and on and on. My personal favorite is the green appletini. It's sweet and tart and crisp, just like an apple. Good times! Place all ingredients into a shaker, and shake well. Strain into a martini glass. Garnish with a slice of apple or a stemmed maraschino cherry. I've often seen this martini made with just the schnapps and the vodka, which I think is a little too harsh. I like to include the apple juice to cut the alcohol a bit. Great then.